Lilac Crystal Journey Natural Soy Wax Jar Candle - 11 oz. Ocean Crystal Journey Natural Soy Wax Jar Candle - 11 oz. Patchouli Crystal Journey Natural Soy Wax Jar Candle - 11 oz. Rose Crystal Journey Natural Soy Wax Jar Candle - 11 oz. 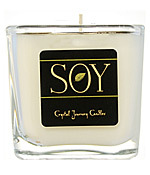 Sandalwood Crystal Journey Natural Soy Wax Jar Candle - 11 oz. Spiced Pumpkin Crystal Journey Natural Soy Wax Jar Candle - 11 oz. Unscented Crystal Journey Natural Soy Wax Jar Candle - 11 oz.